Our Managing Director is a trustee of Indo Swiss Vocational Trust. This trust is keen in imparting vocational training to supervisors and workers and various other activities to maintain the quality standards and be at par with the developing and changing scenario in the world. The Company has secured the ISO – 9001-2000 certification in 2002. The products. manufactured at plants in Maharashtra and Karnataka, are sold all over the country and even exported to the Gulf countries and the US. The Chordia Group has also provided the technology for food processing plants in Iraq and Tanzania. Apart from being widely accepted in the Indian market, “ Pravin “ products have found a large consumer base in the overseas market with the company directly exporting to the entire Gulf Region, USA, UK etc. and have further plans of consolidating its position in other global markets as well. With installation of additional production facilities, we are now in a better position to look for newer market for our branded products. To capitalise on our core strength of manufacturing quality products, we are looking for newer business opportunities in terms of marketing tie-ups with overseas companies of repute. Year 1992,1993 – All India Mango Show, Mumbai – 4 awards. Year 1993 – First in All India Citrus Show. Year 1996 – All India Mango Show, Bangalore – 4 awards. Year 1998 – Highest Recognition from Indian Institute of Packaging, Mumbai. Year 1998 – Certificate of Merit, APEDA. Year 1999 – All India Mango Show, Indore – 3 awards. 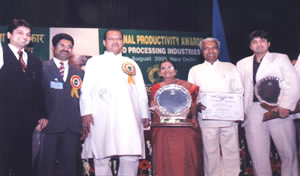 Year 1999 & 2003 – National Productivity Award. Year 2000 & 2003 – Rajiv Gandhi National Quality Award. Year 2002 – ISO 9001-2000 & HACCP Certification.